Revision note.We have added information about one of the "other" Eddie Johnsons, the blues singer who recorded for Imperial. We are finally able to add information about the long-elusive Old Swing-Master 15. "Benson—Bop" gives us a second glimpse of Eddie Johnson as a bop soloist. Edwin Lawrence Johnson was born in Napoleonville, Lousiana on December 11, 1920. According to Howard Reich's obituary ("South Side jazz legend had 'big, beautful sound," April 8, 2010) his father died in an auto accident before he was born. His family moved to Chicago when he was 2 years old. As a teenager, he sang in a vocal group that emulated the Mills Brothers. Eddie Johnson learned the saxophone from his uncle, Joe "Doc" Poston, whose alto sax counterpoint was a legendary feature of Jimmie Noone's Apex Club recordings. "The basic warmth for a sound was instilled in me by my uncle," Johnson told Neil Tesser in 1981. "He gave me my first horn, and he taught me. And every time I was listening to Prez and popping my fingers, he said, 'No, I want you to listen to Hawk, this is the sound I want you to get.' ... So I'd practice whole tones and all of this, but when he wasn't around, I'd revert back to Prez. Nobody swung like Prez." After graduating from Englewood High School, Eddie Johnson was attending Wilson Junior College in Chicago when a recruiter came by from Kentucky State College, which was trying to increase enrollment by building a band that would rival the popular Alabama State Collegians. Johnson and his band moved to Kentucky State in Fall 1938 (or maybe it was Spring 1939) after being offered full scholarships by the school. "I only stayed there about eight months, but we put them on the map," Johnson told Tesser. "The enrollment we brought in pulled them out of the red." He worked at Swingland in Chicago in Johnny Long's Orchestra, a 9-piece band that included Budd Johnson (alto and tenor saxes), Preston Jackson (trombone), Johnny Letman (bass), and "Kansas" Fields (drums); the engagement ended in March 1940. The next year, he was in a Johnny Long Sextet with Jerry Valentine (trombone) and Joe Williams (vocals). That same year, he worked in an octet led by Coleman Hawkins. He sat next to Tom Archia in the Milt Larkin band for a time during its 9 month stand at the Rhumboogie (August 1942 to May 1943). The tension between Dickerson and the band members grew to the point that virtually the entire ensemble was called in front of the Local 208 Board on January 6, 1944. The band was playing too loudly (enough to annoy some of the club's customers), members arrived late, and a bunch of them had skipped a rehearsal. For this act of lèse-majesté (the Local's by-laws included a rule against questioning the president's judgment), Johnson was hauled back in front of the Board on January 20, grilled repeatedly, and fined $10. (Carroll Dickerson had tried in vain to protect Johnson.) The other musicians were reprimanded; Charlie Glenn also appeared before the Union Board and "was told that all of his business must be transacted with the leader of the orchestra, as some of the musicians thought they had no reason to respect Dickerson because the band was on the job when he was engaged as it's [sic] leader." On January 6, 1944, the band consisted of Carroll Dickerson (nominal leader); Gail Brockman, Calvin Ladner, and Raymond Orr (trumpets); George Hunt and J. Taylor (trombones); Nat Jones (alto sax); Tom Archia and Eddie Johnson (tenor saxes); Marl Young (piano, arranger); Clarence Mason (bass); and Hillard Brown (drums). The other alto player, not present at this meeting, was not named. At some point during the next couple of months, however, Charlie Parker would hobo his way to Chicago from Kansas City and take the second alto chair. Bringing in Parker added a stellar talent to the band but complicated the discipline problem; Bird was already notorious for the pranks he had played in the 1942 - 1943 Earl Hines band, and he let everyone know how much show band work and tight arrangements bored him. During the "Dream Band's" troubled tenure, Johnson got his first recording opportunity, with a local all-star combo assembled by Phil Featheringill for his tiny independent label called Session Records. The company, which had opened in November 1943, had a recording program that focused on boogie-woogie piano and Swing combos. From The Jazz Session, January-February 1945, p. 24. Courtesy of Konrad Nowakowski. Jesse Miller (tp); Nat Jones (as); Eddie Johnson (ts); Jimmy Jones (p); John Levy (b); Alvin Burroughs (d). Session, a label owned Phil Featheringill and Dave Bell, was run out of the Session Record Shop at 125 North Wells. 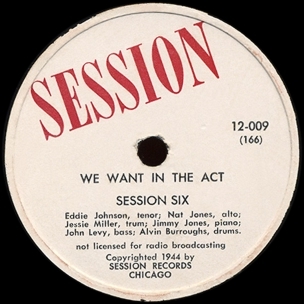 Session liked 12-inch releases and both 78s from this session were of the 12-inch variety. The recording date was announced in a brief item in Down Beat on June 5, 1944. Our listing for this session derives from Charles Delaunay's New Hot Discography (1948, p. 497). The listing has been passed on to later discographers; Lord includes it in his Jazz Discography, with "In the Act" as the title for 166. Many thanks to William H. Korst for alerting us to this outing, which Eddie Johnson has confirmed playing on, and to the original Delaunay listing. Session 12-009 was a 12-inch 78-rpm single, released in December 1944, and first advertised in The Jazz Session of January-February 1945 (p. 24). We know of copies with matrix numbers incised in the shellac and an F prefix; both are characteristic of 1944 pressings from Session. There may be pressings done by Bishop in 1946; these would have matrix numbers stamped in the shellac and a WC prefix. Has anybody seen one? Session 12-008 is listed in Delaunay and elsewhere, but Korst was unable to obtain a copy from Featheringill at the time. Collectors, please let us know whether you have ever come across Session 12-008. We do know that some copies of 12-008 were pressed, because it was reviewed in Down Beat and in Metronome. In the Down Beat review (November 1, 1944, p. 8) the band was identified as Little Acorns; Metronome referred to the band as the Chicago Jazzmen. Before putting out 12-009 Featheringill changed the band's name to the Session Six. Metronome reviewed Session 12-008 in its October 1944 issue, p. 24. The review supplies the long title "Big Oaks from Little Acorns Grow"; "Big Oaks" gets a grade of B- and "I Wished on the Moon" rates a mere C+. An excellent group of little known Chicago musicians make up the complement of this record, but somehow their individual excellences don't coalesce and the finished product is sadly mediocre. There is some fair Nat Jones alto (he used to play such fine clarinet with Duke Ellington) on Moon, a somewhat interesting piano-bass duet lost in the bad recording, and lot of formless force displayed by Eddie Johnson's tenor saxophone. On the better coupling, Jesse Miller gets a break back of his trumpet via an ensemble riff, Nat plays some more, as does Eddie, and a lovely solo by Jimmy Jones, Stuff Smith's brilliant pianist, fades annoyingly into the background along with the rest of a first-rate rhythm section, John Levy, bass, and Alvin Burroughs, drums. Oaks, as solid as Hickory, is an original jump instrumental. It opens with some neat, tricky ensemble. Nat Jones follows with some very Carter-ish alto, and I don't mean ish! There's nothing startling about Jesse Miller's Eldridge-like trumpet get-off, but Eddie Johnson's tenor digs deep and dirty for three choruses in arow, rolling on and on in a fashion that's strictly on the Cobb. John Levy, Phil Featheringill's favorite bass player, executes a very sensible solo quite perfectly in tune as Jimmy Jones tinkles madly in the distance. The closing ensembles allow Alvin Burroughs to break out with some of his fly snare-work. Moon, by Parker and Rainger, opens with a Miller trumpet intro which sets the slow tempo very cleverly. Jones' alto, sounding lead-like, resembles Hilton Jefferson's and Will Smith's even more than Tab Smith's here. Jimmy Jones, like Levy a member of the Stuff Smith Trio, plays a piano that's either out of the world or set way back in the next room. Tenorman Johnson sits right down on his chorus, speaking very smoothly against a four-four backdrop. Judgment-Day Jesse takes it out, dragging his coda behind him. Some of these men are bound to climb aboard the gravy-train soon, the rest will probably remain on the wrong side of the tracks commercially for many moons to come. Hats off to Session for giving them all a break! At least the reviewers agree that Jones' piano was off-mike! Down Beat reviewed Session 12-009 as a Swing record (December 15, 1944, p. 8). The reviewer offered a moderately positive description of the proceedings: "Eddie Johnson's tenor chorus can't compare with Hawkins' famous solo [on "Yesterdays"], but it moves along smoothly just the same. Miller and Johnson alternate to take it out. We Want In starts off with a drum intro from Alvin Burroughs, then moves into a an ensemble passage featuring Jesse on trumpet. Nat and Jesse and Eddie all solo, sounding respectively like Carter and Eldridge and Hawkins. Jimmy's piano is mad, and Al's drumming fly enough as the ensemble finishes the number." If a jam session was ever recorded ["We Want in the Act"] is what it would sound like. On the original, Eddie Johnson plays gutty, driving tenor and Jesse Miller screeches with enthusiasm. Alvin Burroughs, John Levy, Jimmy Jones, and Nat Jones also give good accounts of themselves and the final wild ensemble is in the best jam session tradition complete with Alvin's slightly overemphasized drumming. "Yesterdays' finds the ensemble better integrated and Johnson plays very pretty tenor. A more than capable job by a group of relatively unknown musicians. Korst notes that at the time Jimmy Jones and John Levy were in the Stuff Smith Trio at the Garrick Show Lounge. Meanwhile, Alvin Burroughs (a former member of the Milt Larkin aggregation) was working the basement room of the Garrick (the Downbeat Room) with Red Allen's great jump combo. Jesse Miller was leading his own group at Joe's Deluxe Club (his highest-profile gig would begin in June 1945, when he took over at the Club DeLisa). Nat Jones (who worked with Red Saunders before and after his service at the Rhumboogie) was in the Dream Band at the Rhumboogie alongside Eddie Johnson. The Down Beatitem on the Session session had Eddie Johnson working with a bandleader named "Dickenson" (a garble for Carroll Dickerson). After making these recordings, Featheringill tried to get a Chicago booking for Big Sid Catlett's quartet (which had recorded for Session in New York City). The plan, as Featheringill mentioned in his "Chicago Telescope" column in Metronome (May 1944), was to have Eddie Johnson work in the Catlett quartet in place of Ben Webster, who had made the recording session with Big Sid. If nothing else, this indicated how highly Featheringill thought of Eddie Johnson. But the plans came to naught and Johnson remained at the Rhumboogie. Carroll Dickerson finally gave up leadership of the Rhumboogie house band at a stormy meeting of the Local 208 Board on June 1, 1944. The Local 208 Board called all of the band members on the carpet, so we know that the lineup now consisted of: Paul King, Calvin Ladnier, and Raymond Orr (trumpets); Gerald Valentine and Milburn Newman (trombones); Johnny Houser (alto sax); Ernest Archia and Edwin Johnson (tenor saxes); Marl Young (piano and arrangements); Clarence "Hog" Mason (bass); and Hillard Brown (drums). The second alto, Charlie Parker, was not at the meeting, probably because he was from out of town. The Union administration was still reluctant to confirm Marl Young as the leader, but he was able to take over after more favored candidates turned the offer down. Young claimed in an interview with Charles Walton that he fired Tom Archia and Charlie Parker first thing. However, he kept Johnson on board; Johnson may have given Dickerson trouble, but he was well liked by the club owner and Rhumboogie's clientele. From June 29 through the end of October 1944, Eddie Johnson (billed as "sax solo king") was featured in the Marl Young Orchestra at the Rhumboogie Club that backed headliner T-Bone Walker. However, he was not included in T-Bone's October 10, 1944 session for the Rhumboogie label; Young picked Moses Gant instead. So far as we know, Johnson continued in the Marl Young Orchestra until it closed its run at the club on January 18, 1945. In June 1945, Eddie Johnson was a member of the Stanley Williams Sextet, a Chicago aggregation that included Williams on drums and Nat Jones (who had returned to Red Saunders, then left again) on alto sax. Johnson also worked in a band led by Walter Fuller (formerly a trumpet player in Earl Hines' bands; Walter Fuller would make a few recordings on the West Coast in 1948 and 1949, but none of these included Johnson.). During July 1945, he subbed for Leon Washington in the Red Saunders sextet at the Capitol Lounge on at least one occasion. In 1946, Eddie Johnson joined the popular Swing/R&B band led by trumpeter Cootie Williams, who had departed from the Duke Ellington Orchestra in December 1940. (The exact month is not known, but Johnson was not yet in the Cootie Williams band when it recorded for Capitol on January 29.) This was Eddie Johnson's first shot at national exposure. Involved in two of the big band's recording sessions for Capitol, he was reasonably well featured (five solos) and seems to have garnered some composer credits as well. Cootie Williams (tp, voc); Bob Merrill (tp, voc); E. V. Perry, Otis Gamble, Billy Ford (tp); Clarence "Gene" Redd (tp; vib-1); Ed Burke, Edward "Jack Raggs" Johnson, Julius "Hawkshaw" Watson (tb); Rupert Cole, Daniel Williams (as); Chuck Clarke, Edwin Johnson (ts); Bob Ashton (bars); Arnold Jarvis (p); Pee Wee Tinney (g); Norman Keenan (b); George "Butch" Ballard (d). Capitol 289 and 314 were 78-rpm singles released at the time. Bob Merrill's name is misspelled "Merrell" in the vocal and composer credits on the label of Capitol 289. Official 3014 was a Danish LP. Jukebox Lil [Swe] JB623 was a Swedish Cootie Williams LP titled Things Ain't What They Used to Be. Mosaic MD12-170 is a 12-CD set of jazz recorded for Capitol, released in 1997; MQ17-1710 is its 17-LP counterpart. Classics 981 is a French CD from 1998 titled Cootie Williams and His Orchestra 1945-1946. On the Classics reissue "Vibraphobia" is rendered as "Vibraphonia." Our discographical information derives from the Mosaic set; the LP reissues were supplied by Tom Lord's Jazz Discography. Same personnel minus Pee Wee Tinney (g). Capitol 314 and 15164 were singles released at the time. In the trailoff area, the stamped matrix number for "Bring 'em Down Front" is shown as 991-3L4. Eddie Johnson may have been one of the composers of this number, which features his solo. The flip of Capitol 15164 (907-1 "Stingy Blues") is from the band's session of January 29, 1946 and does not include Eddie Johnson. Official 3014 was an LP titled Rhythm and Jazz in the Mid Forties. All masters from these two Williams sessions are featured on the Mosaic 12 CD box set Classic Capitol Jazz Sessions, which was released in 1997, and on its 17 LP counterpart, Mosaic MQ17-170. 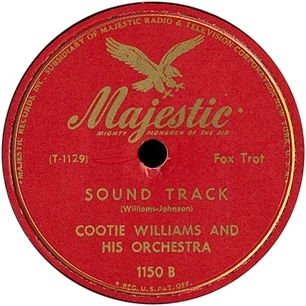 In 2000, this entire session was issued again on Classics 1105, Cootie Williams and His Orchestra 1946-1949. Our discographical information comes from the Mosaic box. Thanks to Dave Penny for bringing these two sessions to our attention; we obtained the LP reissue listings from Tom Lord's Jazz Discography. Somewhat of a mystery is the precise date of Eddie Johnson's departure from the Cootie Williams big band. The band's contract with Capitol expired after the September 1946 session; not long after that drummer Butch Ballard defected to the unit led by Cootie's one-time saxophonist and blues singer Eddie "Cleanhead" Vinson. At a date in early 1947 that no one has pinned down, the band recorded four sides for Majestic in New York City (Majestic was the successor to Hit, which had recorded the Williams band from 1942 to 1945). The notes to Classics 1105 (which includes the Majestic sessions) claim that the band had the same personnel as in September 1946 (clearly false with regard to the drum chair; most likely Sylvester Payne had taken over). Of the four items from this session, only "Sound Track" (matrix T-1129, released on Majestic 1150 B) has a tenor solo, and that sounds like the work of Eddie Johnson. What's more, the composer credit is to Williams and Johnson. 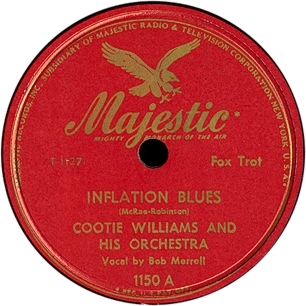 The second (and last) Williams session for Majestic has been dated July 1947. By time Eddie Johnson was definitely working for Louis Jordan. And the tenor solos on this date do not sound anything like him; they may be by Bill "Weasel" Parker, assuming that he would grow in honkitude by the end of the year. Cootie Williams (tp, voc); Bob Merrill (tp, voc); E. V. Perry, Otis Gamble, Billy Ford (tp); Clarence "Gene" Redd (tp); Ed Burke, Edward "Jack Raggs" Johnson, Julius "Hawkshaw" Watson (tb); Rupert Cole (as); Daniel Williams (as); Chuck Clarke (ts); Edwin Johnson (ts); Bob Ashton (bars); Arnold Jarvis (p); Norman Keenan (b); prob. Sylvester Payne (d); Billy Matthews (voc). Majestic 1136 and 1150 were 78-rpm singles released in 1947. On a copy of 1136 that we have seen, the matrix numbers in the wax appear as CT1126M-3 and CT1128M-3. "I Can't Get Started" announces "featuring trumpet solo by Cootie Williams" on the label. On Majestic 1150 the matrix numbers appear in the wax as CT1127M-3 and CT1129M-3; the vocal credit on "Inflation Blues" goes to Bob "Merrell." The Royale LP was a Cootie Williams collection titled Echoes of Harlem. 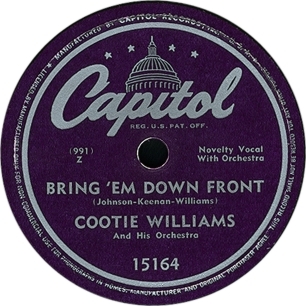 The SwingTimeLP was titled Cootie Williams 1945-1950: Typhoon. In 2000, this session was reissued on Classics 1105, Cootie Williams and His Orchestra 1946-1949. The personnel that we have listed above is conjectural. We assume that Eddie Johnson was still in the band (as appears from the tenor sax solo on "Sound Track") and that Sylvester Payne (who we know was with Williams in December 1947) was at the drums. Meanwhile, Leonard "Heavy" Swain, who would be responsible for the string bass in December 1947, was still working and recording with Eddie Vinson at this date. One might surmise that the "Johnson" who wrote "Sound Track" was "Jack Raggs," the trombonist, but the solos on the tune are for trumpet and tenor sax, not trombone—which favors "our" Eddie Johnson. Rupert Cole and Arnold Jarvis were still in the band in December 1947 (by which time Williams had had to downsize to an octet), so they are safe choices here. The Classics liners assume no change at all since the last Capitol session; Lord's Jazz Discography does no better (though it was helpful with the LP reissues from this session). Early in 1947, Eddie Johnson had to decide between offers from Duke Ellington and Louis Jordan. "I was newly married, and Louis was paying what for the time was big money." Eddie Johnson definitely made five recording sessions with Louis Jordan and his Tympany Five during this 1947; he would also sit in on one broadcast in 1948. Louis Jordan recorded two short sessions in Los Angeles, on January 11 and 23, 1947; there are no solos or exposed work for the tenor sax, so we have no way to tell whether James Wright was still occupying that chair. (However, if Eddie Johnson was in the Williams band for the first Majestic session, as we think likely, the implication is that Wright was still there.) With the Louis Jordan session of April 23, 1947, we get solos that are unmistakably Eddie's work. Louis Jordan (as, voc, ldr); Aaron Izenhall (tp except -1); Eddie Johnson (ts except -1); Wild Bill Davis (p, arr); Carl Hogan (eg; steel-g on -3); Dallas Bartley (b); Christopher Columbus [Joe Morris] (d); The Calypso Boys (maracas, claves -1, 2). Our basic information comes from Tom Lord's Jazz Discography. 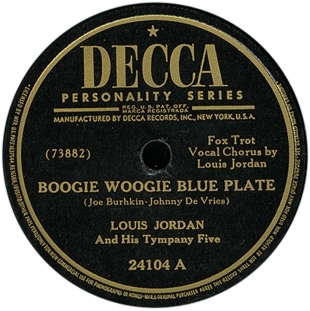 Lord mislists the original 78 rpm issue of "Boogie Woogie Blue Plate" as 24108. Lord also opines that The Calypso Boys are actually Aaron Izenhall and Eddie Johnson. This would be a plausible inference from "Early in the Morning," where the tenor sax and trumpet lay out, but the Boys are also present on "Run Joe" (and mentioned on the label of the original release, though not credited by Lord). Yet all three horns are present and accounted for on "Run Joe." "Barnyard Boogie" (not "Barnyard Boogie Woogie" as rendered by Lord) and "Every Man to His Own Profession" include a solo by Eddie Johnson. On "Barnyard" Hogan takes his solo on a steel guitar. Classics 1010, Louis Jordan and His Tympany Five 1946-1947, is a CD released in 1998. Louis Jordan (voc, ldr); Aaron Izenhall (tp); Eddie Johnson (ts); Wild Bill Davis (p, arr); Carl Hogan (eg); Dallas Bartley (b); Christopher Columbus [Joe Morris] (d). Basic information from Lord. No horns are heard on the mock preachment "Beans and Cornbread." Louis Jordan (as except -1, voc, ldr); Aaron Izenhall (tp); Eddie Johnson (ts); Bill Doggett (p, arr); Carl Hogan (eg); Dallas Bartley (b); Christopher Columbus [Joe Morris] (d). The basic session information is from Lord. Eddie Johnson solos on "Have You Got the Gumption" and "Chicky-Mo Craney Crow." The basic session information is from Lord. The liner notes to the Classics release incorrectly place Will Bill Davis on this session and the preceding one. Lord misrenders the title of 4596 as "Ching-Ching Boogie." It is not hard to see why this one was withheld from release; it's way too close for comfort to Louis' hit "Choo Choo Ch'Boogie." Decca 28444 gives no side designations. Louis Jordan (as, voc, ldr); Aaron Izenhall (tp); Eddie Johnson (ts); Bill Doggett (p, arr); Carl Hogan (eg); Dallas Bartley (b); Christopher Columbus [Joe Morris] (d); Martha Davis (voc). Basic information from Lord's Jazz Discography. Jukebox Lil JB1104 was a Martha Davis LP. Classics 1134 is a French CD titled Louis Jordna and His Tympany Five 1947-1949; it was released in 2000. There are no Eddie Johnson solos on this session. The vocal duet format of two of the numbers cut into the space for instrumental solos. Standard discographies, including Tom Lord's, have Wild Bill Davis at the piano. In fact, Wild Bill was absent from the Jordan band in October and November. He was in Chicago, playing in Claude McLin's combo at least part of this time, and he appears to have made Buster Bennett's last studio session at the the end of December 1947. Bill Doggett had taken over at the November 24 session (bumping out Marl Young, who had been invited to record with Jordan) and would remain as a Tympany Five regular until 1951. 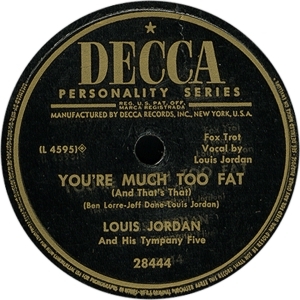 Eddie Johnson made one more recording with Louis Jordan, sitting in while the Tympani Five were playing a Chicago club. Louis Jordan (as, voc, ldr); Aaron Izenhall (tp); Josh Jackson (ts); Eddie Johnson (ts -1); Bill Doggett (p); Bill Jennings (eg); Bob Bushnell (b); Chris Columbus [Joe Morris] (d). All of our session information is from Tom Lord's Jazz Discography. Lord lists the station as WBM, but according to Down Beat's Chicago Band Briefs column (November 3, 1948, p. 4) the Rag Doll had a "WBBM wire" until October of that eyar. Eddie Johnson reportedly did further work with Louis Jordan in 1948 and 1949, but if that is the case it wasn't recorded. After using Paul Quinichette on tenor sax (for a soundtrack in Hollywood, around February 1948), Jordan settled on Josh Jackson as his regular tenor player through the end of 1951. Tom Lord's Jazz Discography, following Jepsen and Bruyninckx, places Eddie Johnson on an April 28, 1949 session that produced two sides by Ella Fitzgerald backed by Louis Jordan and his Tympany Five. 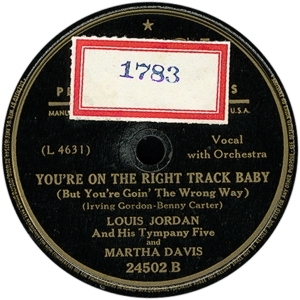 The session took place in New York City; the tracks were "Baby, It's Cold Outside" (matrix 74866) and "Don't Cry, Cry-Baby" (matrix 74867), originally released on Decca 24644. Eddie Johnson is duly credited on some reissues of this material. However, the lineup in Lord is clearly bogus, because Wild Bill Davis is also said to be on piano; what's more, Lord lists matrix W74876-A, "School Days," recorded the very same day by Jordan's group alone, as involving Josh Jackson on tenor and Bill Doggett on piano! 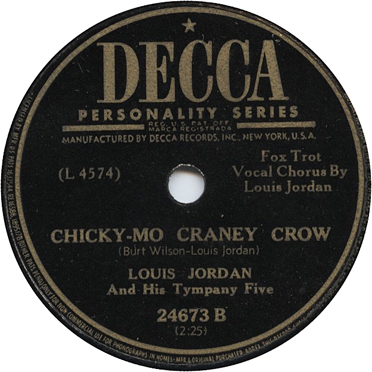 Jackson and Doggett were also present on Jordan's previous session for Decca, which took place on April 12, 1949. It appears that Louis Jordan's 1947 personnel has been mistakenly listed for the April 28, 1949 material with Ella Fitzgerald. What is more, no one would confuse a solo by Josh Jackson (a gritty, bar-walking sort of player) with one by Eddie Johnson. Eddie Johnson told Chuck Nessa that he subbed for Ben Webster in the Duke Ellington Orchestra on more than one occasion—once he was called to Detroit to do so. Presumably this was during Ben Webster's second stay with the Duke, in 1948-1949. From April through July of 1948, Eddie Johnson was a member of the band that Al Benson assembled to play on his broadcasts from the Savoy Ballroom. The Savoy was on its last legs—recent engagements by name artists like Duke Ellington and Charlie Parker had failed to revive its fortunes—and the band's run probably ended when the dance emporium closed its doors for the last time. Charles Walton's interview with trumpeter Lewis "Bill" Ogletree (the interview is among the Bronzeville Conversations listed at http://jazzinstituteofchicago.org/index.asp?target=/jazzgram/bronzeville.asp), mentions the orchestra that Ogletree put together to play at the Savoy on weekends under Al Benson's sponsorship. Benson posted an indefinite contract with the Savoy on April 15, 1948 (the notation WGES on the Local 208 list indicates that live broadcasts were included in the package). Besides Paul King and me, Calvin Ladnier was on trumpet; Willie Randall, Eddie Johnson, Nat Jones, Mac Easton, saxes; Ruth Murray, piano; Oliver Coleman, drums; and Quinn Wilson, bass. We were getting $11.58 per man for that job. 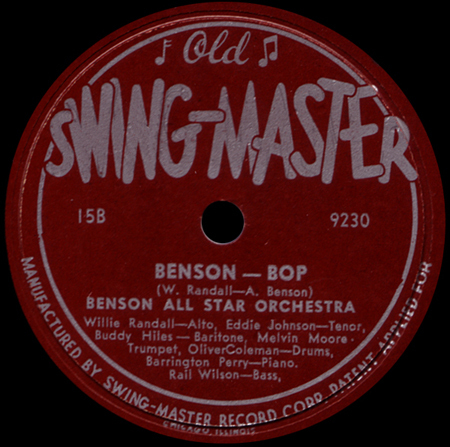 Benson put a freelance recording session together after the Savoy had closed and the band broken up; Johnson had been a regular, along with Willie Randall and Oliver Coleman, while Barrington Perry and Rail Wilson were appearing nightly in violinist Leon Abbey's trio. Melvin Moore (tp); Willie Randall (as); Eddie Johnson (ts); Walter "Buddy" Hiles (bars); Barrington Perry (p); Rail Wilson (b); Oliver Coleman (d); Burress Courtney (voc); Ethel Duncan (voc). According to Bernd Kratochwil, "Die Geshichte des Enterpreneur Al Benson aus Chicago, Teil 2: Old Swingmaster Discography," Rockin' Fifties,1997, pp. 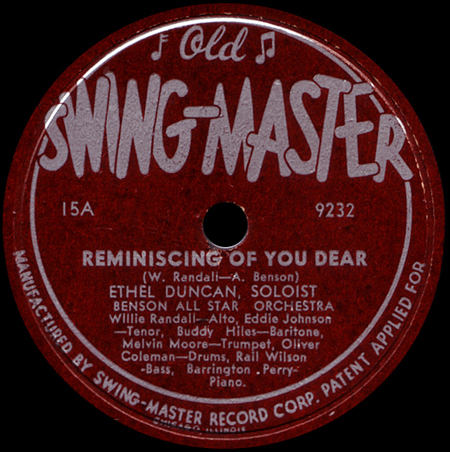 45-59, Old Swing-Master 15 was a 78-rpm single released in April 1949; Old Swing-Master 16 was probably also released in April 1949. Earlier releases on the Old Swing-Master label had been drawn from defunct labels, particularly Vitacoustic, whose masters had fallen into the hands of Egmont Sonderling, the proprietor of United Broadcasting Studios. 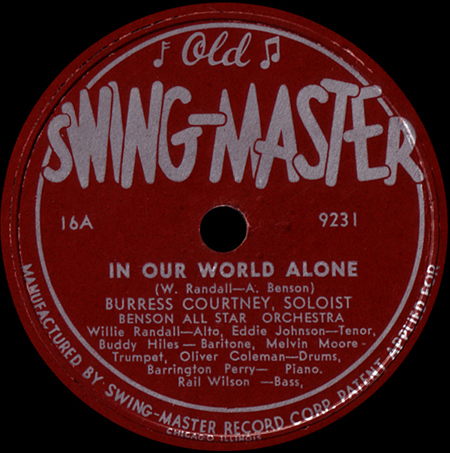 When Sonderling set up the Old Swing-Master label in January 1949, Al Benson was his front man and (unannounced) business partner. So it was natural for the label to pick up unreleased material from a session that Benson had supervised a few months earlier. Our information on "Wiley Willie" and "In Our World Alone" comes from a 78 from Otto Flückiger's collection, and our information on "Benson—Bop" and "Reminiscing" comes from a 78 in Armin Büttner's collection. 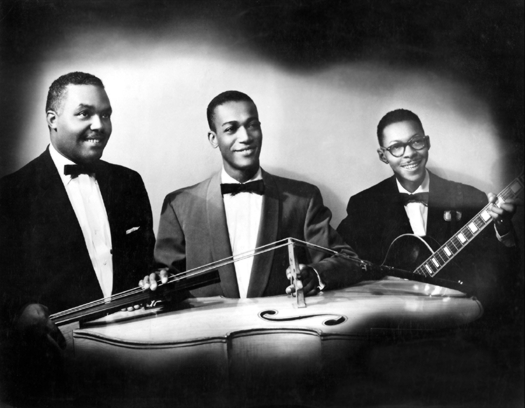 According to Anthony Barnett, at the time of this session, Barrington Perry and Rail Wilson were regular members of the trio led by violinist Leon Abbey. Meanwhile, Buddy Hiles was a former member fo the Earl Hines band. 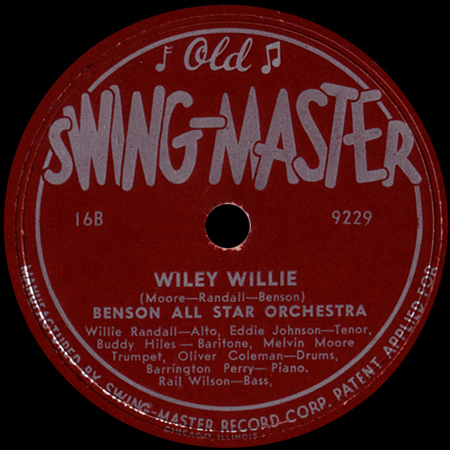 "Wiley Willie" and "Benson—Bop" feature solos by Willie Randall, Melvin Moore, and Eddie Johnson. Only Moore was considered a bebopper but Randall and Johnson fit right in; Johnson sounds a lot like Dexter Gordon on "Benson—Bop." Here is further evidence that Chicago musicians of the period could play bop when the occasion called for it. Willie Randall was the de facto leader on this date. He gets composer credit on all four sides and was probably the arranger on the two ballads, where the Johnny Hodges influence wins out in his playing. We don't know of other recordings by Burress Courtney. 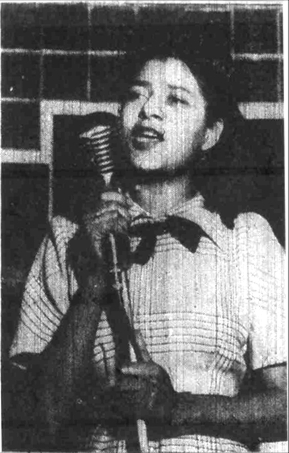 Ethel Duncan remained active through the 1950s and would record again with King Fleming's group. There is some uncertainty about Eddie Johnson's activities in Chicago from August 1948 through 1951. This is because he usually worked as a sideman. On November 18, 1948, Edwin Johnson's 4-week contract with the Flamingo Lounge was accepted and filed by Musicians Union Local 208, but he does not appear on other contract lists from this period. Our best guess is that he was working with pianist Claude Jones. 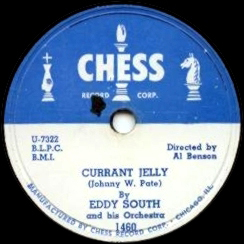 Eddie Johnson's entrée to Chess Records came in the form of a session with the jazz violin virtuoso Eddie South. South was born in Chicago in 1904 and made some of his earlier records there, but spent the later 1930s in Europe. He returned to Chicago in 1948, where he was booked at the last minute into the Rag Doll, playing opposite Anita O'Day. During the gig, South benefited from assiduous promotion by agent Al Milton; he did so well that he decided to remain in Chicago. 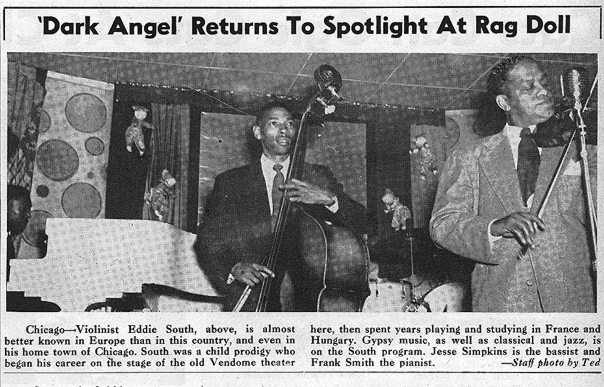 During the Rag Doll engagement, South used a trio with Frank Smith on piano and Jesse "Po" Simpkins on bass. We don't know whether Eddie Johnson worked occasionally with South's group in the clubs, or he was added strictly for recording purposes, along with vibist Bill Thompson. Again supervised by Al Benson, who of course knew Johnson from his Savoy Ballroom band, the session started a recorded association between Eddie Johnson and Johnny Pate that would last until 1958. Eddie South (vln); Eddie Johnson (ts); Bill Thompson (vib); Claude Jones (p -1, Organo -2); Johnny Pate (b, arr); Oliver Coleman (d); Al Benson (voc -3). Anthony Barnett's book on Eddie South, Black Gypsy (Allardyce, Barnett, 1999), cleared up several persistent errors about this session; Lord's Jazz Discography uses the Barnett book for its Eddie South listing. Barnett has identified the correct recording date, the original issue of two of the sides, and the two unissued items. According to Claude Jones, as interviewed by Barnett, the organ-like instrument used on this session was a Lowrey Organo, an electronic device that attached to the piano. The Organo operated rather like the Solovox (used during this era by such Chicago-based performers as Sonny Blount, aka Sun Ra, and Cleo Brown Napier) but according to Jones, it had a wider range and was a more versatile instrument. Al Benson put this session together during the period between the collapse of Old Swing-Master (in June 1950) and his first attempt to establish Parrot in November 1952. Benson established a steady working relationship with the Chess brothers at this time. 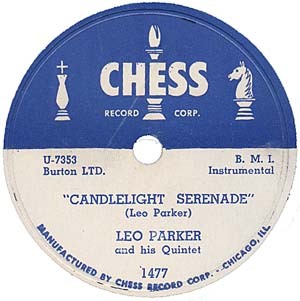 Chess 1460 was a 78 and 45 rpm single released around April 1951. Chess CHV-415, South Side Jazz, was a various-artists LP issued in 1972. Bellaphon BJS4032 was a German LP reissue and Chess 50026 was a French LP reissue. 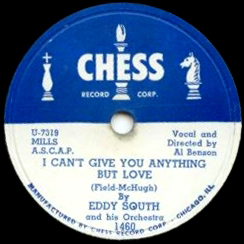 According to Anthony Barnett, the alternate take of "I Can't Give You Anything But Love" (on which Eddie South does not play pizzicato) was the one used on the LP releases. The take originally released on Chess 1460 includes a pizzicato passage. Barnett has verified that that the same take of "Currant Jelly" was used on Chess 1460 and on Chess CHV-415. Leo Parker (bars); Eddie Johnson (ts); Claude Jones (Organo -1, p); Johnny Pate (b); Al Williams (d). Our session information is from Tom Lord's Jazz Discography. Lord, however, credits no drummer, and lists Al Williams and Leonard Chess (!) followed by "vocals?" The above personnel list is on the Chess reissue LP of this material. Leonard Chess can be heard announcing the take on "Hornet." According to Mario Schneeberger, Claude Jones plays organ on "Reed Rock." Once again, this is actually the Lowrey Organo (see the previous session for details about this device). The Vogue issue was titled "Rock Reed"! Lord gives July 7, 1951 as the date. The Chess reissue LP has July 4, 1951, as does Ruppli's Chess discography. Chess 1477 was a single released around September 1951, and Vogue V3179 followed not long after. Chess CHV 413, Leo Parker: The Late Great King of the Baritone Sax, was released in 1972; it also included 5 tracks by Leo Parker and rhythm from a previously unissued session for Parrot from August 10, 1953, plus one cut each by Sahib Shihab (with the Clarke-Boland Band) and Red Saunders (featuring Mac Easton). This album was reissued in Germany on Bellaphon BJS4031. Lord incorrectly puts "Reed Rock" on the LP. After using Eddie Johnson and his usual combo partners on the Leo Parker date, Leonard Chess decided that he might just have found a saxophone-playing standard bearer to replace Gene Ammons, whose contract with Prestige was now being more rigorously enforced by that company. He recorded Eddie as a leader and rushed out his first single with what, in the early days of the Chess label, was heavy promotion. 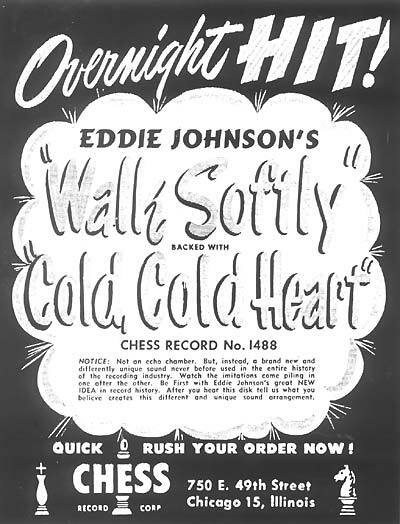 Ad for Eddie Johnson's first single, from Billboard, November 1951. Eddie Johnson (ts); Gail Brockman (tp); prob. Bennie Green (tb); Andrew "Goon" Gardner (as, bars); Nat Jones (as); Claude Jones (p); Johnny Pate (b); Oliver Coleman (d). Lord gives most of the personnel and the matrix numbers; however, his release number for "Cold Cold Heart" and "Walk Softly" is 1498 instead of 1488. Chess 1488 was a 78 and 45 rpm single, issued in November 1951 (it was advertised and reviewed in Cash Box on November 24; thanks to Dan Kochakian for supplying this information). Chess 1503 was released around April 1952. A listen to Chess 1503 (from Otto Flückiger's collection) supports the lineup given in previous discographies. However, a listen to Chess 1488 (from Yves Smierciak's collection) indicates that the second alto sax switches to baritone, and that a trombonist is present (he has a brief solo on "Walk Softly"). Although Eddie Johnson recollects doing a session with Johnny Avant, the soloist resembles Bennie Green. More research is needed, clearly. Eddie Johnson (ts); Claude Jones (p); Johnny Pate (b); Oliver Coleman (d); plus strings. Lord gives no personnel information, but the rhythm section on "At Last" sounds like the usual suspects: Claude Jones, Johnny Pate, and Oliver Coleman. The next Chess recording session (U7424-7425) was by Jimmy Rogers and Eddie Ware and took place on February 11, 1952. Chess 1503 was a 78 and 45-rpm single released in April of 1952. Eddie Johnson (ts, voc); Claude Jones (p); Johnny Pate (b); Oliver Coleman (d); Edna McRaney (voc). Lord lists this as an instrumental session by Eddie Johnson and his quartet with strings. Not exactly. Thanks to dubs and label images supplied by Mike Kredinac, we learn that "This Love of Mine" was an instrumental and that the vocalist featured on "Back-Up" was Edna McRaney. Contrary to Lord, there are no strings in evidence on either side. Chess 1512 was a 78 and 45-rpm single, released in May 1952; it was mentioned in Billboard's "Record Round Up" on June 7 of that year. This was before Arc Music opened; the music publisher for "Back-Up" is given on the label as Burton Ltd, BMI. We can be sure that John Henry "Lawyer" Burton did not write "Back-Up," however. Meanwhile, "Sanicola" is misspelled "Sanicolm" on the other writing credit. Stompin' 24 is a various-artists LP released in 1998, with the redundant title Stompin' 24. Edna McRaney had previously appeared on Chess 1496, a single recorded at a Jackie Brenston session on December 15, 1951, and released around February of 1952. At the "World's Rarest Records" Web site, http://www.tefteller.com, a rare copy of "Hi, Ho Baby" by Jackie Brenston and Edna McRaney can be seen; it was pressed on opaque red vinyl. Eddie Johnson continued to avoid being a "contractor" with nightclubs in Chicago. Maybe his bad experience with the Union back in 1944 led him to want to minimize involvement with the Local 208 office? Whatever the reason, his name seldom appears on the Local 208 contract lists. Our surmise is that Claude Jones or another leader normally took care of the contracts. For instance, in August 1952, Claude Jones and Johnny Pate signed a contract for 2 weeks at the Streamliner Cafe (accepted and filed by Local 208 on August 7). Eddie Johnson (ts); others unidentified. Eddie Johnson (ts); Claude Jones (p); Johnny Pate (b); Oliver Coleman (d). Our basic information comes from Lord (who turns the September 12, 1952 session into two partially duplicative listings). The artist credit on the original release, however, is to "Eddie Johnson and his Orchestra" (Ruppli gives "Eddie Johnson and his Band"). Thanks to Daniel Gugolz for a dub of Chess 1544, a 78- and 45-rpm single released in July 1953; it was reviewed in Billboard on July 18, 1953 (p. 36). 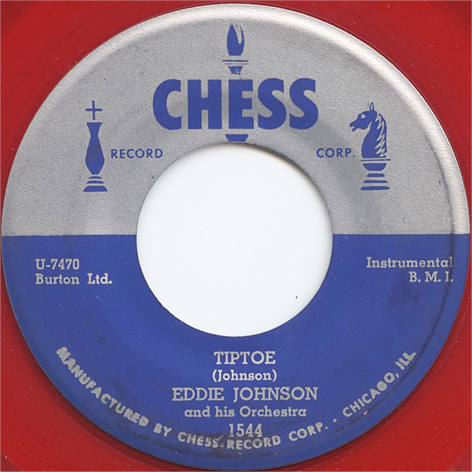 "Eddie's Boogie," listed as a separate item without matrix number by Lord, is really an alternate take of "Tip Toe"—another sign that the compilers of the Chess Vintage Series jazz LPs were working without documentation. Chess CHV-415 was a various artists LP released in 1972; Bellaphon BJS4032 is a German reissue; Chess 50026 is a French reissue. Thanks to Dani Gugolz for pointing out that "Eddie's Boogie" is a different take not identical with the one originally issued on Chess 1544. Al Smith (b, ldr); James "Red" Holloway (ts); Eddie Johnson (ts except -1); McKinley Easton (bars except -1); Clarence "Sleepy" Anderson (p); William "Lefty" Bates (eg except -1); Leon Hooper (d); Bobby Prince [Charles Gonzales] (voc). "Smoke" and "I Want to Hold You" have both been listed in discographies as U2245. The matrix numbers in this entry are taken from 78s in Otto Flückiger's collection. Chance 1124 was a 45 and 78-rpm single released at the time. Lord lists Chance 1128 as 1138, which of course was by Johnny Sellers. Chance 1128 was released by February 1953; a Billboardad from that month, reprinted in Gart's First Pressings, claims that the single is "on the way to the top" in various markets. Well, maybe. Vogue was the French label by that name; V3371 and V3372 were 78-rpm singles released at the time. Basic information from Walter Bruyninckx' Swing Discography. Jepsen's Jazz Records conflates this session with a subsequent Al Smith session (without Eddie Johnson) that produced U2253, "Blue Mood." Jepsen's entry for Bobby Prince gives no date or location (and the same personnel as Bruyninckx gave for the instrumental tracks!). Obviously these items were cut at the same date. Relying on the incorrect personnel printed on the Vogue labels, Bruyninckx lists Paul King on trumpet when none can be heard on "Tell Me Why," "Smoke," or "I Want to Hold You." He skips over Lefty Bates' guitar, which is quite audible on "Tell Me Why" and "I Want to Hold You." On "Smoke Gets in Your Eyes" the band is reduced to tenor sax, an eerie, falsetto wordless vocal by Bobby Prince, and rhythm. Red Holloway, in an interview with Armin Buettner and Otto Flückiger, stated that he played tenor and Bobby Prince did the strange vocal. In fact, there are clearly two tenor saxes on this date: all existing discographies incorrectly credit Red with playing alto sax, when none can be heard. 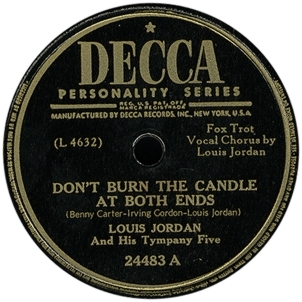 It is not known whether "For Eternity" had a vocal, though the use of "Blue Mood" (recorded without Johnson in November 1952) as an instrumental coupling for "Smoke Gets in Your Eyes" suggests that it did. Unfortunately, Eddie Johnson was unable to take full advantage of Leonard Chess's efforts to launch him as a bandleader and jukebox tenor soloist. His career was sidetracked by illness. The September 1953 issue of Jet reported that Johnson was hospitalized in Chicago with tuberculosis. (In his obituary, Reich stated that Johnson "had lost half a lung to tuberculosis at age 23." We are not sure whether he had suffered a previous bout of the disease, although this could explain why he was not drafted during World War II.) We do not know exactly when he was able to return to playing, though we have heard about two live recordings from 1955. When Johnson did take up work as a musician again, it was part-time; he went into the insurance business, then worked for the Veterans Administration. Johnson's old associate Johnny Pate was active in the clubs in 1955. At the beginning of the year he signed an indefinite contract with the Streamliner Lounge (accepted and filed by Local 208 on January 6). In March he filled in for 2 days at Harry's Show Club and extended his relationship with the Streamliner for 7 weeks (both contracts posted on March 17, 1955). In April he inked a contract for 6 more weeks at Harry's (posted April 7). On May 5, he posted another indefinite contract with the Streamliner. On November 3, he posted another indefinite contract with Harry's. Johnny Pate (b); Eddie Johnson (ts); Ronnell Bright (p); Charles Walton (d). According to Art Zimmerman, a Chicago physician, Dr. Jerome Love, recorded many nightclub performances and concerts by jazz musicians in Chicago between 1952 and 1959. Love made binaural recordings, using a dummy head with microphones mounted on each side. Each reel of tape contained up to 30 minutes of music. The Love archives contain 6 reels from this performance (up to 3 hours of music). Personnel and date as per the Love archives; the leader's name is misspelled "Tate" and the drummer's name comes out "Walden." And the location is not given. From what is known about other recordings in the Love archives, some of the titles will be incomplete. Eddie Johnson (ts); others musicians unidentified; Lurlean Hunter (voc). According to Art Zimmerman, the Love archives contain 7 tapes (up to 3 1/2 hours) of binaural recordings from this evening's music. No location is specified in the documntation. There are 20 titles listed; these are split among the Eddie Johnson Trio, the Johnny Pate Trio, and the Bill Henderson Trio. (Pate and Henderson could have been playing in the Johnson Trio, but we don't know the exact lineup in each grouping.) Well known Chicago vocalist Lurlean Hunter (see our Seymour page for more about her career) sang on some of the tracks. The Johnny Pate Trio, 1957 edition. From left, Floyd Morris, Johnny Pate, and Wilbur Wynne. Courtesy of Ace Records. Johnny Pate (b, arr); Edwin Johnson (ts -1); prob. Lennie Druss (fl -2); Floyd Morris (p -3); Claude R. Jones (org -4); Wilbur Wynne (eg); Vernel Fournier (d). Otto Flückiger, Dieter Hartmann, and Robert Pruter have helped with this rather confusing session. Tom Lord's Jazz Discography has two sides being cut for King in Chicago on December 13, 1957. He gives the personnel minus the flute player, and puts Floyd Morris at the piano and Claude Jones at the organ. Since neither one was mainly an organist, and Morris played organ on the James Moody session (see below), this could be disputed. However, Morris was a regular in Pate's group for several years, and was always billed as playing piano, so it more likely that Jones was called in to play organ on this occasion. Moreover, Claude Jones had made some recordings in the early 1950s on the Lowrey Organo (see above). Federal 12314 was a 45-rpm single released at the time. President PRC 80 was a four-tune EP released in France, date uncertain. We infer from the serial number that King KS16006 was a 16 2/3 rpm release; other contents unknown. "Pattin'" starts with piano (probably Jones), then organ (probably Morris) is added. The piano is either in really bad shape or it has been fitted with tacks! "Walkin'" has just the organ. Eddie Johnson has excellent tenor sax solos on both sides; they are almost as good as "Tip Toe" and "Twin Rock" from his best 1952 session. "Muskeeta" is a variation on "Tequila"; the flutist shares the theme with Johnson. He also takes the solo. Only piano is to be found here. It turns out that this "Muskeeta" (matrix number unknown, issued on the President EP) is not the originally issued "Muskeeta," which was recorded on March 20, 1958 and appeared on Federal 12325 with matrix number F1292-1 (the flip side on that occasion was "Pretty One," matrix F1291). The issued "Muskeeta" used only the flute (played by Ronald Wilson on this occasion), no tenor sax. At a session on November 29, 1957, Pate had cut four sides with Lennie Druss on flute and Johnnie Wynne playing rhythm guitar behind Wilbur. Most likely the success of "Swinging Shepherd Blues" from the November 29 session (it was Johnny Pate's only hit) led to the remake. "Swinging Shepherd Blues" from the November 29 session is played by the flutist (solo) with guitar (solo), bass and drums - no keyboards. The label of Federal 12312, in Robert Pruter's collection, states on both sides, "instrumental featuring Lennie Druss on flute." A "Muskeeta" with Johnson's tenor (and flute, presumably contributed by Lennie Druss) would most likely have come from the December 13 session. It might also have been cut on November 29, 1957, but only if Johnson showed up just to do the one side (the four that are known from this session—F595, "Swinging Shepherd Blues"; F596-1, "The Elder"; F597, "Easy Does It"; and F598, "Five O'Clock Whistle"—all feature flute only). Since there is no tenor sax solo on "Muskeeta," there is a further small possibility that the tenor-flute version was cut at the March 20, 1958 session with Ronald Wilson overdubbing himself, and does not include Eddie Johnson at all. Lord mentions further issues of "Muskeeta" on British Parlophone PMD1072, R4437, and 45R4437. It is not known whether these feature the flute-only "Muskeeta" or the tenor-flute version (though Lord lists all of them under F1292-1). King LP584, a Johnny Pate compilation titled Swingin' Flute, presumably contains F1292-1, though strange things have been known to happen. Worth checking! Around the time of this session, or shortly afterward, Eddie Johnson signed on with the City of Chicago as a tabulating machine trainee. He rose steadily as the computer age advanced; by the late 1970s he had become the chief systems engineer, on call 24 hours a day in case a system crashed. As he advanced at the day job, he lost the opportunity to play music at night, and had to restrict himself to country club dances and other weekend social events. James Moody (as, ts, fl) with Johnny Pate (b, arr, ldr); Fortunatus Paul "Fip" Ricard (tp); Earl Turner (tp); George "Sonny" Cohn (tp); John Avant (tb); Bill Adkins (as); Lennie Druss (as); Vito Price (ts); Sandy Mosse (ts); Eddie Johnson (ts); Laurdine "Pat" Patrick (bars); Floyd Morris (org); Julian "Junior" Mance (p); Isaac "Redd" Holt (d). All information from Tom Lord's Jazz Discography. Mario Schneeberger notes, however, that "All the Things" was also on Argo LP 637. Argo LP 637 was the original release from the end of 1958. Argo EP 1080 was presumably from around the same time. Cadet 2CA60010 was a collection of James Moody's Argo recordings, issued in the 1970s. Chess 2ACMJ-403 is a 1980s LP reissue. Chess GRD 810 is a CD reissue from the 1990s. On this date, Eddie Johnson was part of a studio big band playing arrangements behind James Moody's solos. 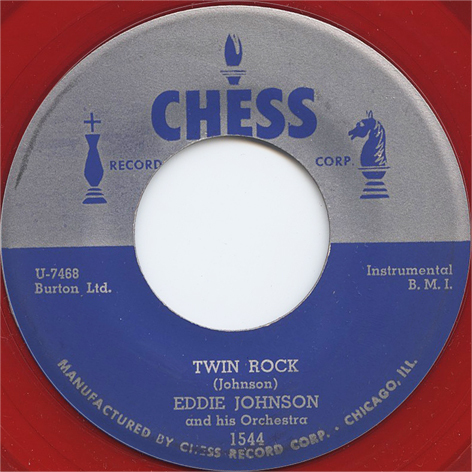 According to Joe Segal in his liner notes to Chess CHV-415, Eddie Johnson recorded with the Duke Ellington Orchestra on "seven or eight" occasions. In fact, Paul Gonsalves would drop out of the Ellington Orchestra from time to time because of his addictions, and Eddie Johnson, who had both the R&B background and the ability to emulate Ben Webster, would have been a suitable replacement (as was another Chicago tenor saxophonist—Harold Ashby, who eventually became a full-time member of the Ellington band). The only recording that Segal specifies is the Duke's album of Mary Poppins tunes, and Eddie Johnson confirmed his presence on four numbers from the album. Duke Ellington (p, comp, arr); Cootie Williams (tp); Cat Anderson (tp); Herbie Jones (tp); Nat Woodard (tp); Lawrence Brown (tb); Chuck Connors (tb); Buster Cooper (tb); Jimmy Hamilton (cl, ts); Johnny Hodges (as); Russell Procope (as, cl); Eddie Johnson (ts -1); Paul Gonsalves (ts -2); Harry Carney (bars, cl, bcl); John Lamb (b); Sam Woodyard (d). Our session information is derived from Tom Lord's Jazz Discography, which, however, has Paul Gonsalves on all 12 tracks. After listening to the LP with Chuck Nessa, Eddie Johnson identified 4 tracks that he had played on. According to Nessa, "Harry Carney remembered [Johnson] and called to see if he would sub for the 'ill' Gonsalves". Other sessions that Duke Ellington is known to have recorded in Chicago during 1964 and 1965 were live at Holiday Ballroom, May 31, 1964; a TV Soundtrack, January 12, 1965; and studio sessions on March 31, May 18, and May 20, 1965. Chicago musician Paul Serrano substituted on trumpet on at least one of these, so further participation by Eddie Johnson is not out of the question. But it would take tremendous acuteness of ear to identify any of Johnson's contributions unless he soloed on at least one number. In the late 1960s and early 1970s, Eddie Johnson worked weekend gigs with Red Saunders' big band (which no longer operated full-time, after the closure of the Regal Theater) and in combos led by trad pianist Art Hodes. After several inactive years, Eddie Johnson returned to playing in 1979, commencing a second career that would last nearly 25 years. In September 1980, he appeared at the Chicago Jazz Festival to enthusiastic acclaim. Toward the end of the year, he retired from his job with the City of Chicago and became a regular at a club called Andy's. His re-entry into the music scene would soon lead to the first recording under his own name since 1952. Shortly before this, however, he recorded two strong sessions with trumpter Yves François Smierciak, including a remake of "Tiptoe." As Smierciak says, "I happen to be a great fan of Eddie Johnson, so much so that in March 1981 I had 2 recording sessions with Eddie and Franz Jackson on tenor saxes added to my regular band (with Joe Johnson on piano, a friend of both of theirs)." Yves François Smierciak (tp, voc, arr); John Gorman (tp -2, 3; v-tb); Steve Mengler (tb -1, 2); Franz Jackson (cl -2; as; ts -1, 3; voc); Eddie Johnson (ts); Marc Smierciak (as -1, 2, 3; ts -3); Joe Johnson (p); Jeff Lindahl (b); Ken Voelker and Eric Haggard (d); Kathy L. Brown (bg voc); Sharon Waltham (voc). Information about this recording session comes directly from Yves Smierciak. Two LPs that included material from this session were released in early 1982. Pinnacle PLP-111 was titled Roll 'em Pete; Pinnacle PLP-12 was Saturday Night Fish Fry. Pinnacle PLP-111 also contained four tracks ("The Riff"; "Bye Bye Baby, Goodbye"; "Get the Mop"; and "Evil Man Blues") that were recorded in early 1982 with Paul Bascomb and Herbert "Jeep" Robinson on tenor saxes—this was the last session for both of these musicians. Pinnacle PLP-112 contained 10 tracks ("She's Gone"; "Just a Feeling"; "What Did He Say? "; "Lester Leaps In"; "Let's Twist Some More"; "Beat and the Blues"; "Downhearted Blues"; "Night Wind"; "Garbage Man Blues"; "Hassell Road") that were recorded in early 1982 with Paul Bascomb and "Jeep" Robinson. disques SY 2-002 was an Yves Smierciak CD titled Un Deux Trois and released in 1996. Delmark DE-565 is a CD reissue from May 2005 titled Blues for Hawk and released under the leader's current performing name, Yves François. The Pinnacle tracks were remixed, new trumpet solos by the leader replaced those originally recorded on some tracks, and the vocal was deleted from "Alcoholic Baby," which has reverted to the song's original title. On "When I Grow Too Old to Dream" Eddie Johnson takes the first tenor sax solo and Franz Jackson takes the second one. Takes 1 and 4 of "I Wished on the Moon" give Jackson the first tenor sax solo and Eddie Johnson the second one. On take 1 of "Last Call for Alcohol" Eddie Johnson gets the tenor sax solo and Franz Jackson plays clarinet. On take 2 Johnson and Jackson are allotted the same responsibilities; the trumpet parts and the bass part on this take were re-recorded in 1994. Marc Smierciak is the alto sax soloist on both takes. On "Blues for Hawk" take 2, Eddie Johnson opens with his introduction to Leo Parker's "Candlelight Serenade," transposed to a different key, and continues with a solo; Franz Jackson's tenor solo follows. Tom Lord's Jazz Discography lists the two Pinnacle albums, but with collective personnel only and no precise recording dates. Yves François Smierciak (tp -1, 2, 3, 4; voc, arr); John Gorman (tp -1, 2, 4); Steve Mengler (tb -1, 3, 4); Eddie Johnson (ts); Franz Jackson (cl -3; as -4; ts -1, 2, 3; voc); Marc Smierciak (as -1, 3; ts-4); Joe Johnson (p); Jeff Lindahl (b); Odie Payne (d). An LP that included material from this session was released in early 1982. Pinnacle PLP-111 was titled Roll 'em Pete. Tom Lord's Jazz Discography lists this Pinnacle LP, but with collective personnel only and no precise recording dates or unissued tracks. On "Roll 'em Pete" take 1, Franz Jackson solos first (on tenor sax), followed by Marc Smierciak on alto and Eddie Johnson on tenor. Two more cycles of Jackson/M. Smierciak/Johnson follow. A second trumpet part was overdubbed on this take in 1989, when all of the material from this session was remixed by Joannie Pallatto at Sparrow Sound Design in Chicago. On "Roll 'em" take 2, there are solos by Marc Smierciak (alto), then alternating 12-bar choruses by Franz, Eddie, Franz again, and Eddie again. On both takes of "Comin' in Home," Franz Jackson is responsible for the tenor sax solos; the solos on both takes of "Tiptoe" belong (of course) to Eddie Johnson. "Catnip" (a "Tiger Rag" derivative...) opens with a tenor solo by Franz Jackson; after the trombone and trumpet solos, Eddie Johnson solos while Jackson accompanies him on clarinet. "Spider Crawl" has a tenor sax solo by Eddie Johnson and an alto sax solo by Franz Jackson. On "Mecca Flat" Franz Jackson plays the opening chorus on alto sax; Eddie Johnson gets a tenor solo, and Jackson follows with an alto solo. About the decision to include "Tiptoe" on this session, Yves Smierciak says, "Tiptoe is the Eddie Johnson song originally recorded... 8 years before I was even born! It was that 78 (Chess 1544) that turned me on to Eddie when I was about 18." Delmark DE-565 is a CD reissue from May 2005 titled Blues for Hawk and released under the leader's current performing name, Yves François. The Pinnacle tracks were remixed, new trumpet solos by the leader replaced those originally recorded on some tracks, and a new vocal by Sharon Waltham replaced the leader's original vocal on "Spider Crawl." Eddie Johnson (ts); Johnny Board (ts); John Young (p); Charles "Truck" Parham (b); Phil Gratteau (d); Don De Michael (vib); Jo Belle (voc). The last two titles of a radio broadcast from Andy's (11 East Hubbard Street) over WBEZ-FM are preserved on a tape in the collection of Yves François Smierciak. All three sets were apparently broadcast, so much more material from may have been preserved by others. On "Flyin' Home'" Eddie is first with a great, multi-chorus solo, followed by Board, who as an ex-Hampton tenorist would, spends 2 choruses quoting Illinois Jacquet's solo. On "St. Louis Blues," Board is responsible for accompanying part of Jo Belle's vocal and Eddie Johnson gets the tenor sax solo after the vocal. Polly Podwell (voc); Bobby Lewis (flg); Eddie Johnson (ts); Joe Johnson (p); John Defauw (g); Truck Parham or John Whitfield (b); Barrett Deems (d). A radio broadcast featuring excerpts of performances from different clubs includes Polly Podwell's vocal and the first 10 bars of Eddie Johnson's solo after the vocal. Bobby Lewis was also mentioned by the announcer. Chuck Nessa (email communication, March 24, 2010) has identified the rhythm section. More material from this performance is almost certainly extant. Paul Serrano (tp except -1); Eddie Johnson (ts); John Young (p); Eddie de Haas (b); George Hughes (d). Nessa N-22 was an LP released toward the end of 1981. Tom Lord's Jazz Discography incorrectly has Paul Serrano playing only on "Splanky," "Misty Thursday," and "My Baby Just Cares for Me." It's worth noting that Serrano also owned the recording studio. Thanks to Chuck Nessa for information about the unissued track. Eddie Johnson returned to the Chicago Jazz Festival in September 1981, where two sets of music were broadcast. Paul Serrano (tp); Eddie Johnson (ts); John Young (p); Eddie de Haas (b); George Hughes (d). There is a tape of 40-minute broadcast with good sound quality. The broadcast originated with the Chicago-area National Public Radio station. The personnel is announced on the broadcast and is the same group that recorded for Nessa. The tape box that this item came from has June 3rd as the date, but the festival was in September (Labor Day weekend, to be exact). In January 1999 some CDs were burned containing this and the following session. Joe Williams (voc) with: Paul Serrano (tp); Eddie Johnson (ts except -1); Roland Faulkner (eg); Norman Simmons (p); Dan Shapera (b); Vernel Fournier (d). A tape of a 40-minute broadcast in good quality survives. The personnel is announced by Joe Williams. On "All Blues" Williams improvises blues lines above the Miles Davis tune. In January 1999 some CDs were burned containing this and the preceding session. Very likely other Eddie Johnson performances from the 1980s were broadcast. Collectors, please fill us in if you have Eddie Johnson broadcasts not listed here. Brad Goode (tp except -3); Paul McKee (tb except -3); Frank Tiberi (ss -2; cl except -2 and -3); Eddie Johnson (ts except -3); John Young (p innards -3; p); Eddie DeHaas (b); Joel Spencer (d); Duane Themm (vib -1); Nancy Riley (voc); Everett Green (voc). This historical overview of Chicago jazz was made specially for Ameritech (a large regional telecommunications company, one of the "Baby Bells," with headquarters in Chicago) in 1992. The serial number on the CD is unknown (if in fact there was one). Thanks to Eddie De Haas for providing a dub. Eddie Johnson is plentifully featured with solos (and a prominent vocal accompaniment on "Lover Man"). Steve Jensen (tp, flh, ldr); Art Davis (tp, flh); Thomas Shabda Noor (tp -7, flh -7); Dave Urban (tp, flh); Jeff Helgesen (tp, flh); Danny Barber (tp, flh); Jeff Lindberg (tb, ldr, cond); Scott Bentall (tb); Paul McKee (tb -8); Edwin Williams (tb); Tom Kordus (tb, euph -5); Art Lisner (btb -2); Michael Young (btb except -2); Greg Flint (Fr hn -4); Dan Anderson (tu -5); Steve Duke (fl, ss, as); Chris Lega (fl, ss, as); Edward Petersen (fl, ts); Jerry DiMuzio (cl, Eb cl, ts); Eddie Johnson (ts -3); Glen Kostur (bars -1); Les Thimmig (bars, cl except -1); Charlie Harrison (eg -6); Frank Mantooth (p, arr); Mike Barnett (b); Bob Chmel (d); Freida Lee (voc); Neal Hefti (arr, comp); Billy Byers (arr, comp); Thomas Fredrickson (arr, comp); James Knapp (arr); Oleg Lundstroem (arr). We learned of this session from the online All Music Guide. Sea Breeze CDSB-2049, a CD called Diggin' In, was released in 1994 according to that source. Confirmation about the identity of our Eddie Johnson on this session comes from an invitation for the 100th birthday celebration for Duke Ellington in Chicago, April 11, 1999 (see below). Further session details (including the correct recording date and substitutions on some tracks) are from Lord's Jazz Discography. Eddie Johnson appears on three tracks from this CD, according to Lord. Lord does not credit Jeff Lindberg with playing trombone. We learned of this release from the online All Music Guide. EPM Musique FD152152, a French CD called Chicago Non Stop, was released in February 1996. Recording date and complete personnel information from Lord's Jazz Discography. Jodie Christian's recording band in 1996, from the cover of Delmark 490. Norris Turney is at front left, Jodie Christian is in the center, Eddie Johnson at rear right, and Sonny Cohn at front right. Sonny Cohn (tp except -3); Norris Turney (as); Eddie Johnson (ts except -3); Jodie Christian (p); John Whitfield (b); Ernie Adams (d -1); Gerryck King (d -2); Francine Griffin (voc -4). Delmark DE-490, a CD called Front Line, was released in early 1996. Details from the CD leaflet. Eddie Johnson does not play on "Willow Weep for Me" and "Don't Get around Much Anymore," which are features for Norris Turney, but he is very much in evidence on the remainder of the CD. While noting that Sonny Cohn spent 24 years in Count Basie's trumpet section (1960-1984), liner note writer David Kuner fails to mention Sonny's 15 years with Red Saunders (1945-1960). This was a major oversight, since his notes were meant to put the spotlight Chicago musicians like Cohn, Eddie Johnson, and Jodie Christian. Kurt Elling (voc) with Eddie Johnson (ts); Laurence Hobgood (p); Rob Amster (b). Thanks to Miguel de la Cerna for alerting us to the sessions with Kurt Elling. Information from the liner of The Messenger. The other tunes on this Kurt Elling CD are without Johnson. Kurt Elling (voc, dialogue); with Art Davis (tp); Eddie Johnson (ts, dialogue); Laurence Hobgood (p); Rob Amster (d); Michael Raynor (d). Yule Be Boppin' is a various-artists collection of Christmas tunes, released by Blue Note in 1997. Other artists include Pat Martino, Fareed Haque, Bob Dorough, Judi Silvano, etc. Information from the liner notes. No recording dates are given, unfortunately. Kurt Elling (voc) with Eddie Johnson (ts); Laurence Hobgood (p); prob. Rob Amster (b); Michael Raynor (d). The other tracks on this CD called This Time It's Love are without Johnson. Information from the liner. Eddie Johnson (ts); John Young (p); Eddie de Haas (b); George Hughes (d). Delmark DE-515, Love You Madly, was released on CD in the summer of 1999. All information from the liner notes. Until the venue closed (in late 1999 or 2000) Eddie Johnson worked Thursday evenings with his group the Jazzmasters (basically the above lineup plus Paul Serrano), at Alexander's Restaurant and Lounge. He also worked regularly at Andy's on Hubbard Street. Tenor saxophonist Eddie Johnson is one of Chicago's last direct performance links to Duke Ellington. Johnson performed with Ellington in the mid-60s during a Chicago recording session (Mary Poppins album) at the old Universal Studios. The Jazz Members Big Band of Chicago more recently changed its name to the much wieldier Chicago Jazz Orchestra. Kurt Elling (voc); Von Freeman, Eddie Johnson, Ed Petersen (ts); Laurence Hobgood (p); Rob Amster (b); Michael Raynor (d, perc). Blue Note 7243 5 222112 7 is a CD released in February 2000. The three tenorists are only heard on these portions of the CD, which was recorded on July 14, 15, and 16, 1999. 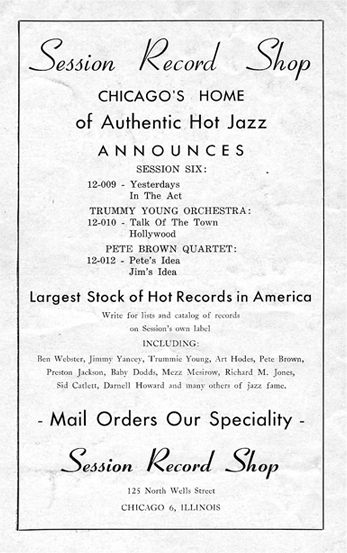 The liner notes state that the horns were invited on the first two days. All three tenorists have short unaccompanied duets with Elling before the band comes in, then everybody solos again. Other guest spots on the CD go to Jon Hendricks and Kahil El'Zabar. Mike Ferro (voc); Eddie Johnson (ts); Howard Levy (hca); Joe Vito (acc); Johnny Frigo (vln); Dave Onderdonk (g); Larry Gray (b); Phil Gratteau (d). This CD on the Chicago-based Denwa label was released on July 28, 2000. It consists of pieces by Django Reinhardt with lyrics added by vocalist Mike Ferro. Personnel from the Denwa site; it is unlikely that all of the musicians play on every track. Ferro's titles are followed by the titles of Django's original compositions in parentheses. See the Denwa Web site at http://www.denwarecords.com/jazz/merchandise_jazz.html. 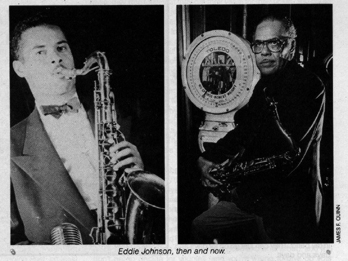 Eddie Johnson continued to make occasional appearances with the Chicago Jazz Orchestra. On March 29 and 30, 2003, he was a featured soloist with the band when it presented Something to Live For: A Tribute to Billy Strayhorn. Concerts took place at the Museum of Science and Industry (March 29) and at the Harold Washington Library Auditorium, 400 South State Street (March 30). Jeff Lindberg conducted and vocalist Frieda Lee and trumpeter Orbert Davis were also featured. He would continue performing for another year or so after this appearance. 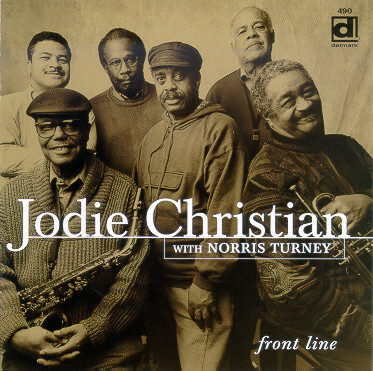 Sonny Cohn, who had been Eddie Johnson's front line partner on the Jodie Christian session from 1996, died on November 7, 2006, at the age of 81. Eddie Johnson had now retired from playing in public because of advancing emphysema. He died of pneumonia at Little Company of Mary Hospital in Evergreen Park, Illinois on April 7, 2010. He was 89; his wife, son, and brother had predeceased him, and he left his companion, Patricia Robinson, and three nieces. On April 25, the Chicago Jazz Orchestra will perform a memorial concert for him. Much of his success lay in the fact that his music so accurately captured the man. E.J. was effortlessly kind, soulful and gracious, and you heard all that on a ballad. But he had a spark of whimsical mischief that kept things lively, whether on the stand - where it could set a solo blazing - or at the bar, after the set, where it would erupt in infectious laughter over a small-batch bourbon. There have been several other Eddie Johnsons in jazz history. 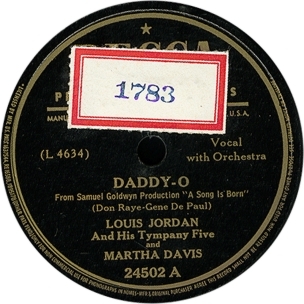 Eddie Johnson, the pianist and bandleader from Saint Louis, recorded "The Duck's Yas Yas Yas" in 1932 with his Crackerjacks, featuring Harold "Shorty" Baker on trumpet (oddly, the recording session took place in Atlanta). In the early 1960s, he operated a small label called ELJ in partnership with singer Leroy Harris and pianist/vocalist Joe Buckner. The company, which never got any distribution outside the St. Louis area, released two singles by Joe Buckner and three that marked the very last recordings by legendary alto saxophonist Tab Smith. Eddie Johnson's own releases, of which two are known, use his trio to back Harris, who was into lounge ballads. Johnson does work in a two-fisted piano solo on the one side with real jazz content, "What Is This Thing Called Love." Edward Johnson played trombone and was known as "Eddie" or "Jack Raggs." As we've noted, he was a member of the 1946 Cootie Williams band at the same time as "our" Eddie Johnson. Ed "Penny" Johnson was a trumpet player from Kansas City who worked with Harlan Leonard and Tommy Douglas. According to Dave Penny, this Eddie Johnson was a blues shouter in Los Angeles. Lord, deriving his information ultimately from Jepsen, erroneously includes this session with "our" Eddie Johnson's, and credits Eddie Johnson with both vocals and tenor sax. But close listening to "Mr. Juice Head" and "Troubled Woman" (in the late Otto Flückiger's collection) shows that the tenor sax plays under the vocalist at the end of each tune. Imperial 5120 and 5126 were singles released at the time; Colony C101 came out in 1951 on a short-lived Imperial subsidiary. In fact, Lew Chudd of Imperial signed "Eddie Johnson, blues warbler" to a "term disking" contract in January 1951 (Billboard, January 20, 1951, p. 24; the date was given as "last week"). In a conversation with Chuck Nessa, the Eddie Johnson who is the subject of this Web page denied making this session. On inspecting the entry in Jepsen, his comment was, "Does that look like the kind of songs I'd do?" In fact, the other releases on Colony were by such performers as Mercy Dee, Smokey Hogg, and Smiley Lewis. Thanks to Anthony Barnett, Miguel de la Cerna, Otto Flückiger, Daniel Gugolz, Tom Kelly, Bill Korst, Terry Martin, Eric LeBlanc, John Litweiler, Chuck Nessa, Dave Penny, Art Zimmerman, and Gilbert Daspit Sr. for their help with this page. Joe Segal's liner notes to South Side Jazz and Neil Tesser's detailed notes to Indian Summer were our main biographical sources. Konrad Nowakowski's collection of Session 78s and documentary material about the label helped us to improve our coverage of Eddie Johnson's first recording. Click here to return to Red Saunders Research Foundation page.